This year I taught at the Wisconsin Sheep and Wool festival for the first time. It was marvelous! It'sa smaller show (7,500 people) than the gargantuan shows like Maryland and Rhinebeck, and that's great. It's one of those shows that people talk about being great, but I've never been quite sure. This show moves at a slower pace giving everyone time to talk and shop and learn. This show really is what I think about when I think about a state sheep and wool festival. Andrea Mielke Schroerwrote a great recap of the show itself for the Craft Industry Alliance blog. I had an excellent time. My friend Erica rode along with me. We stopped at a Tandy leather store on our way from Michigan to Wisconsin. The fairgrounds are presided over by a giant cow, the Michigan fairground has a huge chicken. There were so many sheep and educational booth here and I had time to actually see them. There are two barns for shopping, and they are packed with handpicked vendors. I shopped at Snyder Spindles, Fiber Optic, Jennie the Potter, Green Mountain Spinnery. I am regretting a few things. One is not buying a sweater's worth of yarn at Green Mountain! Another involves some incredible Jacob roving, but I may remedy that one. My classes were fantastic, they were full and the space was a little tight, but everyone was happy to accommodate and move furniture. My students spun like the wind and had the best questions! Everyone was just happy and friendly at Wisconsin Sheep and Wool. The classroom photo up there is from Emily Wohlscheid's Tweed Batt class, I forgot (again) to take pictures in my classes. There was excellent food too, several food trucks came over from Madison and I would like to eat the Shepherd's Pie (with lamb) dumplings I had, every single day. Ann Krieg took us to a supperclub for dinner - it's a Wisconsin thing and it was retro-cool. On the way home Erica and I had to stop at the Mars Cheese Castle and I donned the hat. Now I know what everyone meant when they said the Wisconsin show is great; I'll be applying to teach at Wisconsin again next year! 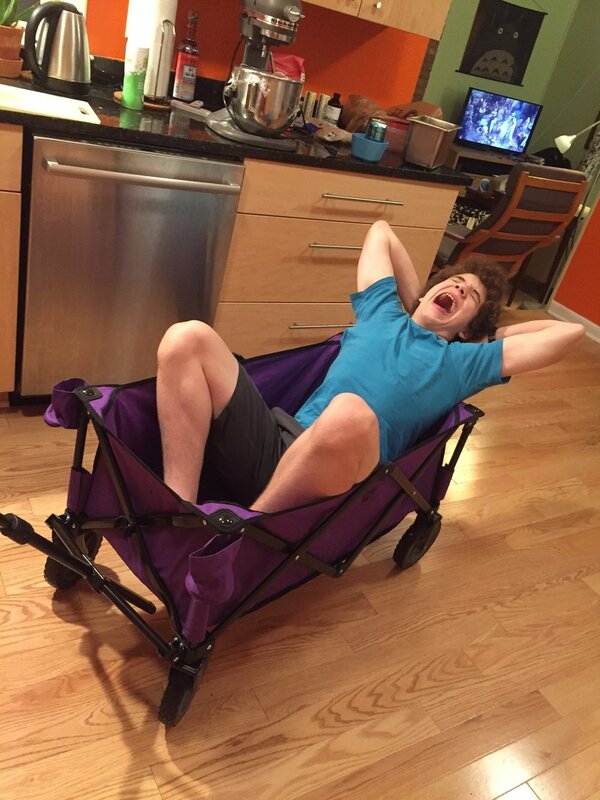 In case you were wondering, my cart came and it holds a tired teenage boy. And yes, I gave him a ride in it.